Gingernut Books is proud to announce the release of Illusions by Philip Gardiner, best selling author and award winning film director; this is his first new book for a while. Steve's life could have ended - should have ended. He should have died in the middle of nowhere, far from his family. Steve Burton isn't an ordinary man. He was once, but not now. He's The Healer. Out Now in Kindle format the latest version of Deadlier than the Male. 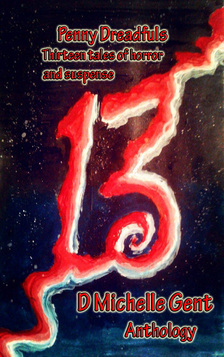 Unlucky Thirteen stories and poems to give you chills and pause for thought. Bite-sized stories from vampires to B.E.Ks and beyond with the added extra of 'Penny Dreadful' two-sentence horror stories to keep you awake at night. Brides for Clemmants is a historical ghost story set in the late 1700s. by the Historical Novel Society's Editors Choice author F E Wharmby. This is the third book in the Alienbutt saga. The forces of Emperor Fluffy sweep across the Inner Systems, crushing all resistance. General Jee gathers what forces he can muster to make a final stand at Earth. With the Universe fallen into chaos, Alienbutt must lead the survivors of the Ick and work out a plan to prevent the invasion of the Outer Systems. The first of three books by F E Wharmby. Set in Eastwood, Notts. England around 1790. An historical novel based on fact about a group of Romani Gypsies. Memoirs of Insanity is said to be the prequel to the series as the story is the inspiration behind Insanity. The story covers the journey a man takes between childhood and adulthood and the events create who he becomes. Follow him on his journey, toward Insanity, through it and beyond. This book is a fictional account based on a set of diaries. A gothic sci-fi adventure.After years of war, peace has fallen over the earth, due to a mysterious voice claiming to be humanity’s god. However, despite this apparent revelation, not everything is as straight forward as it seems. Prepare to enter a gothic world as scientists Margot Grant and Jade Wilde are confronted with hooded deceivers, obnoxious vampires and necromancers. This is a fight for freedom like no other as unlikely heroes discover how to destroy angels. This fantastic book was recorded onto tape by Joan because Joan is blind. It follows Joan's early life during the 1940s, the end of the war years and her memoirs of family life. Which are poignant, hilarious and moving.